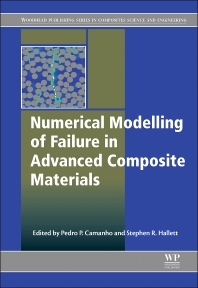 Numerical Modelling of Failure in Advanced Composite Materials comprehensively examines the most recent analysis techniques for advanced composite materials. Advanced composite materials are becoming increasingly important for lightweight design in aerospace, wind energy, and mechanical and civil engineering. Essential for exploiting their potential is the ability to reliably predict their mechanical behaviour, particularly the onset and propagation of failure. Part One investigates numerical modeling approaches to interlaminar failure in advanced composite materials. Part Two considers numerical modelling approaches to intralaminar failure. Part Three presents new and emerging advanced numerical algorithms for modeling and simulation of failure. Part Four closes by examining the various engineering and scientific applications of numerical modeling for analysis of failure in advanced composite materials, such as prediction of impact damage, failure in textile composites, and fracture behavior in through-thickness reinforced laminates. Industrial and academic researchers working in composite materials, aeronautics, automotive and energy applications and the development of technical textiles. Pedro P. Camanho is a professor at the department of mechanical engineering of the University of Porto. His main research interests are the mechanics of deformation and fracture of polymer composite materials, and new concepts for advanced composite materials for aerospace applications such as hybrid, variable stiffness and ultra-thin composites. Professor Camanho has been a visiting scientist at NASA-Langley Research Center since 2000, was a visiting scientist at the U.S. Air Force Research Laboratory, and has coordinated several research projects funded by the European Space Agency, Airbus, NASA, Daimler AG, Aernnova, European Union and US Air Force. He was the recipient of the 2006 NASA H.J.E. Reid Award for Outstanding Scientific Paper, the 2005 Young Researcher in Applied and Computational Mechanics Award from the Portuguese Association of Theoretical, Applied and Computational Mechanics, and the 2005-2009 Engineering Fracture Mechanics Most Cited Articles Award. He has published over 70 papers in international peer reviewed journals and is a member of the Council of the European Mechanics Society (EUROMECH).